No Premier League team in the past 22 seasons has won the title after winning a single point or less in their first two games. So in that sense, purely statistically, Chelsea have a slim chance of retaining their crown. They have one point from two games. In fact the only time in the league’s 23 completed seasons when a team have won fewer than two points in their first two games and then won the title was in the first season 23 years ago, 1992-93, when Manchester United began with two defeats. 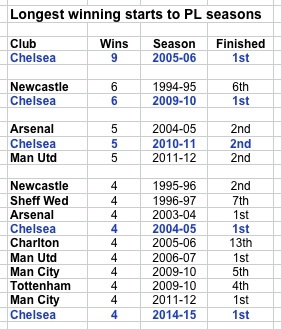 That isn’t to say Chelsea cannot win the league. Or that they won’t. It remains at such an early stage that in a pre-internet era the newspapers would not have published the first league tables yet, and fans would not know where their clubs stood. Chelsea could spend like there’s no tomorrow, reinforce, regroup, recover Jose Mourinho’s mojo and canter forward. 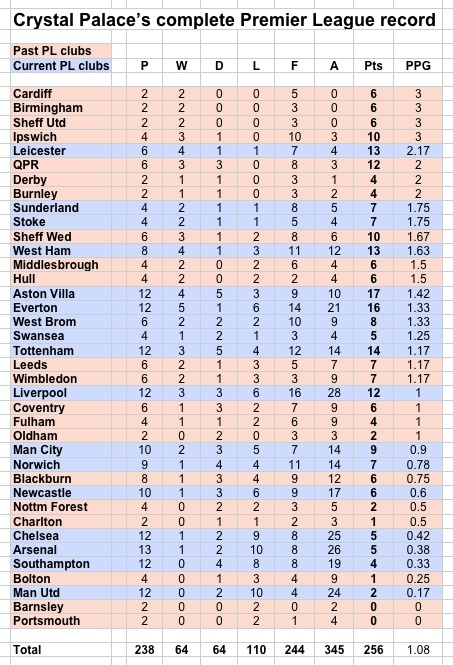 It’s just that statistically, the records show that teams in the Premier League era don’t – with one exception – begin as badly as Chelsea and then win the title. The most common start for the eventual champions is either two wins or a win and a draw; these have happened eight times each in 23 seasons. 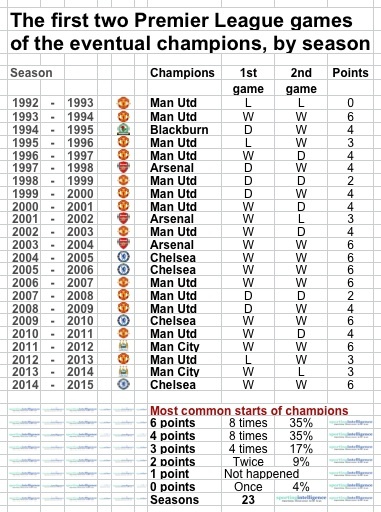 The next most common start is one win and one defeat (five times) and then two draws (twice). 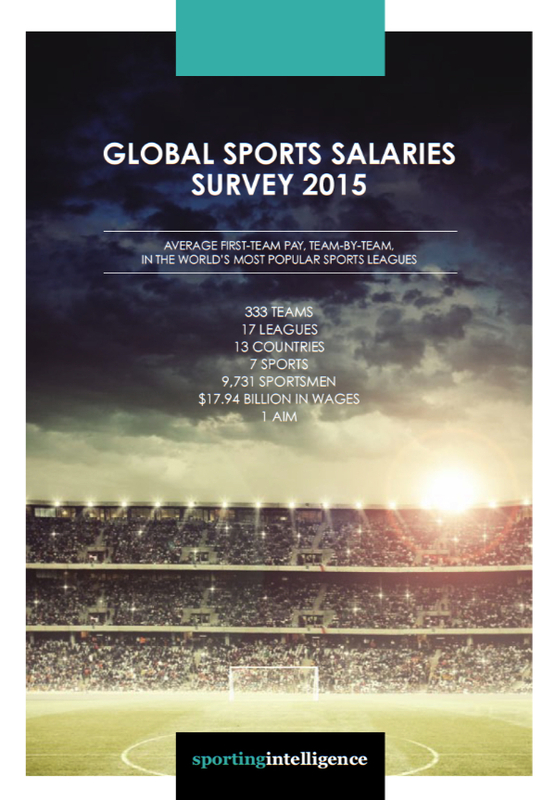 So in 96 per cent of seasons, the eventual champions have started with two or more points. Here’s the breakdown. So what do the statistics tell us about the teams that have made a perfect two, with two wins from two? Actually they tell us that starting off with winning streaks won’t necessarily land you the title. Of the 16 teams who have started with four consecutive wins over the years, fewer than half of them (7 of 16) have gone on to win the title. All four of Chelsea’s Premier League titles began with runs of at least four straight wins, in 2004-05, in 2005-06 (with nine wins to start), in 2009-10 (six) and last season (four). They also started with a five-game winning run in 2010-11 but only finished second. This season is only two games old but only four clubs have 100 per cent records so far: Manchester City, Leicester, Liverpool and Manchester United. At this stage last season there were just four clubs as well with two wins from two: Chelsea, Swansea, City and Tottenham. Two of them finished as winners and runners-up and the others finished in the top eight. It is 17 seasons since Chelsea failed to register a win in either of their opening Premier League games. That season’s start was: 19 Aug 1995 Chelsea 0 Everton 0; 23 Aug 1995 Nottm Forest 0 Chelsea 0; 26 Aug 1995 Middlesbrough 2 (Hignett, Fjortoft) Chelsea 0; 30 Aug 1995 Chelsea 2 (Wise, Hughes) Coventry 2 (Isaias, Ndlovu); 11 Sep 1995 West Ham 1 (Hutchison) Chelsea 3 (Wise, Spencer 2). Chelsea finished the season 11th. 16 Mar 2003 West Brom 0 Chelsea 2 (Stanic, Zola); 30 Oct 2004 West Brom 1 (Gera) Chelsea 4 (Gallas, Gudjohnsen, Duff, Lampard); 4 Mar 2006 West Brom 1 (Kanu) Chelsea 2 (Drogba, Cole J); 15 Nov 2008 West Brom 0 Chelsea 3 (Bosingwa, Anelka 2); 16 Apr 2011 West Brom 1 (Odemwingie) Chelsea 3 (Drogba, Kalou, Lampard); 3 Mar 2012 West Brom 1 (McAuley) Chelsea 0; 17 Nov 2012 West Brom 2 (Long, Odemwingie) Chelsea 1 (Hazard); 11 Feb 2014 West Brom 1 (Anichebe) Chelsea 1 (Ivanovic); 18 May 2015 West Brom 3 (Berahino 2, Brunt) Chelsea 0. Crystal Palace are playing their sixth season of Premier League football in their fifth spell in the division. They were founder members in 1992-93 and lasted one season before relegation. Then the next three times they were promoted, they were ‘one-season wonders’ each time and were immediately relegated. Then two seasons ago, after their fourth promotion, they finally survived, and last season survived again to complete their first back-to-back PL seasons. Bournemouth, Watford and Norwich will all want to avoid being one-season wonders but history is against all three of them doing that. Only twice in 23 seasons have all three promoted clubs survived: in 2001-02 Fulham, Blackburn and Bolton all survived and four seasons ago Norwich, Swansea and QPR followed suit. 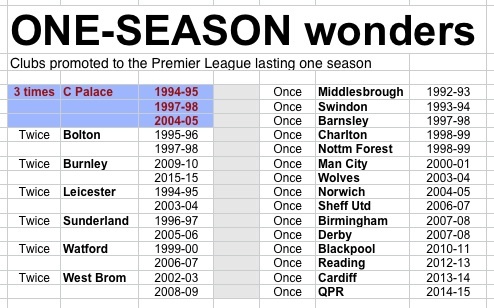 Of the 68 promoted sides before this season, 30 have been one-season wonders. That means each of this season’s newcomers have an individual chance of 44 per cent of going down, and collectively one or more are likely to go. Here are the one-season wonders to date. As Palace continue to bask in a third successive season of Premier League football, they entertain Aston Villa on Saturday at Selhurst Park. Palace have taken more PL points from Villa in absolute terms (17) than from any other PL opponent, albeit having played them more times than they have played some other sides.